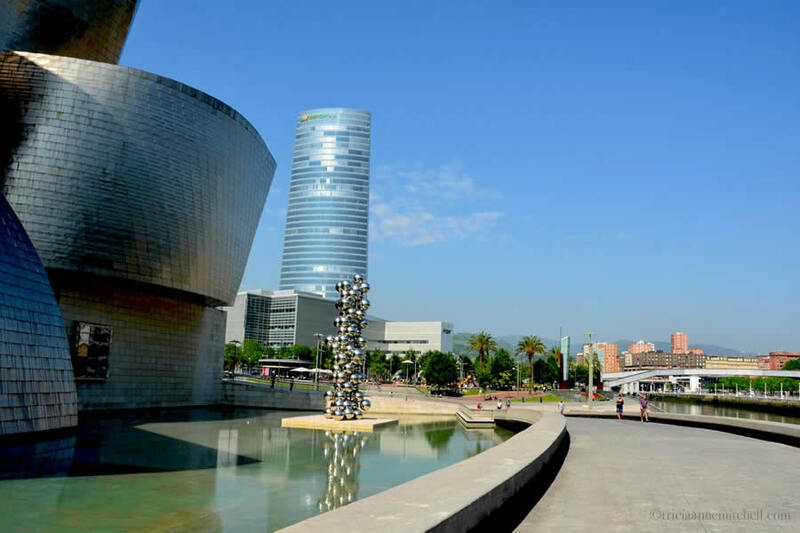 Journey to Bilbao, Spain, and the city’s celebrated Guggenheim Museum, and you’ll no doubt find yourself charmed by the modern-art museum’s ‘pet’ exhibit, Puppy. 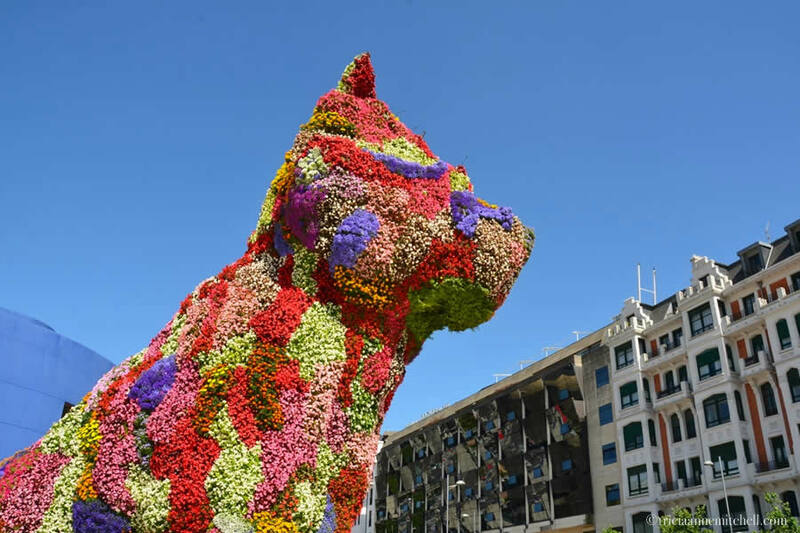 The 12 meter-tall canine (about 40 feet), modeled after a West Highland White Terrier pup, is comprised of thousands of flowers. It stands guard in front of the shimmering Guggenheim Museum, which was designed by architect Frank Gehry, and opened in 1997. While I’m sure Puppy is probably effective at eliciting smiles from most passersby, I was personally fond of the flowery topiary since it reminded me of childhood dogs, Jenny and Bonnie, both Westies and real-life versions of Puppy. 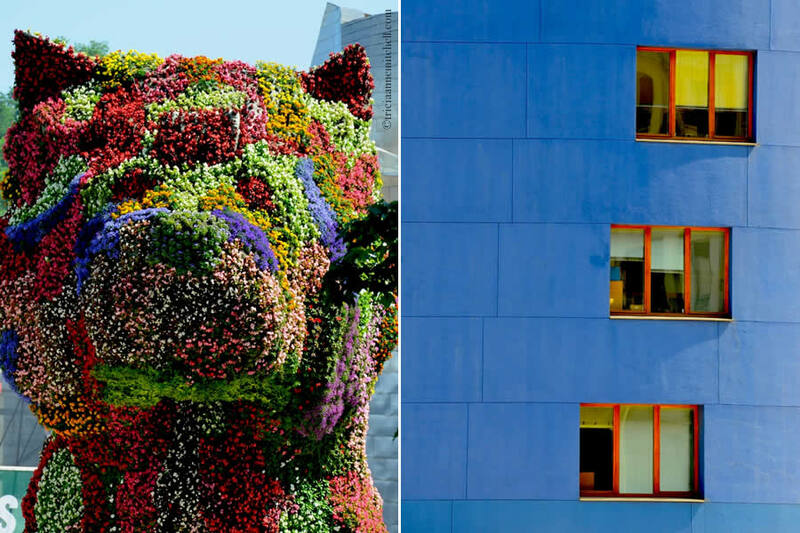 Puppy’s creator, Jeff Koons, used computer modeling to design Puppy, and when we visited, the canine sported blooms ranging from begonias, to marigolds and petunias. 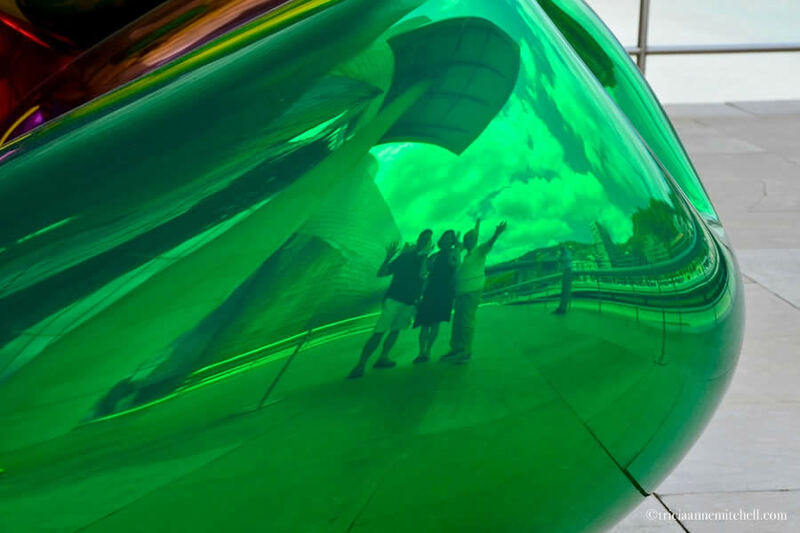 Walking around the titanium, glass, and limestone exterior of the museum, we also glimpsed other creative sculptures – ranging from a gargantuan spider, to glimmering stacked balls, and a bouquet of fluorescent tulips. Inside, I found myself most taken by two works of art: The Matter of Time by Richard Serra and The Visitors by Ragnar Kjartansson. The former is made of large curved sheets of weathered steel, which create a maze of sorts, and fascinating acoustics. These features invite visitors to get lost among them, and perhaps even hum a tune to see how sound bounces off the sculpted forms. The Visitors, on the other hand, is a video installation featuring nine different screens. (Unlike The Matter of Time, it is just a temporary exhibition.) Walking into the room in the middle of the 64-minute program, we were introduced to nine different characters – each playing a musical instrument in a different room of a classic upstate New York home. In one room, for example, a man played a guitar in a bathtub; in a living room, a man tickled the ivories of a stately grand piano, and in a formal parlour, a woman passionately belted out the tune on an accordion. What united the actors is that they sang or played the same song, making observers feel as though they were perhaps attending a concert, or even pacing from room to room to glimpse the activity in each sumptuous interior. I loved how it invited participants to physically move from screen to screen, in a choose-your-own-adventure fashion. While some of the exhibitions inside did not appeal to me quite as much as Kjartansson and Serra’s work, we appreciated how the museum’s holdings got us thinking more creatively. And just as it’s worthwhile to visit the Guggenheim at different times of day to observe how its exterior changes color under varying types of light, we never grew tired of seeing Puppy. 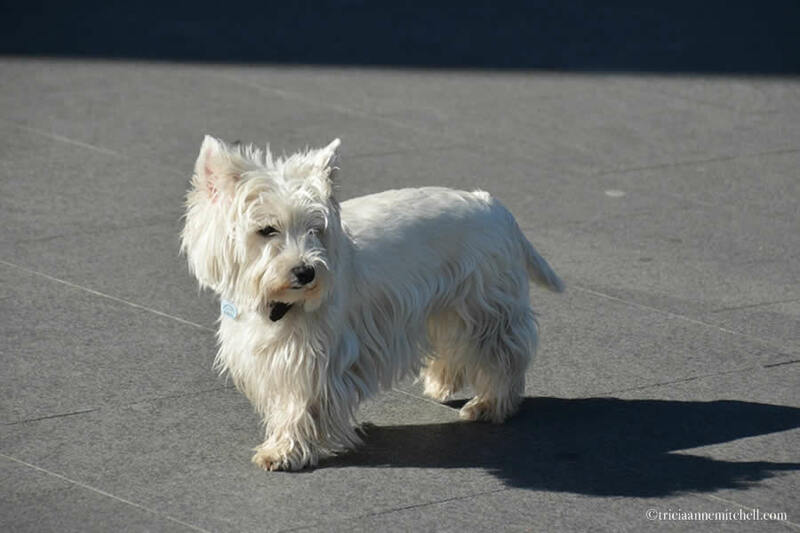 We saw a plethora of West Highland White Terriers roaming the streets of Bilbao, with Puppy no doubt popularizing the breed among Bilbao residents. A Scottish Terrier named, not surprisingly, Puppy. Puppy’s reflection is broken into a mosaic-like pattern on a building across the street from the Guggenheim. Schoolchildren on a field trip flock to a musician belting out tunes on his clarinet, as water vapors lend a mysterious air. 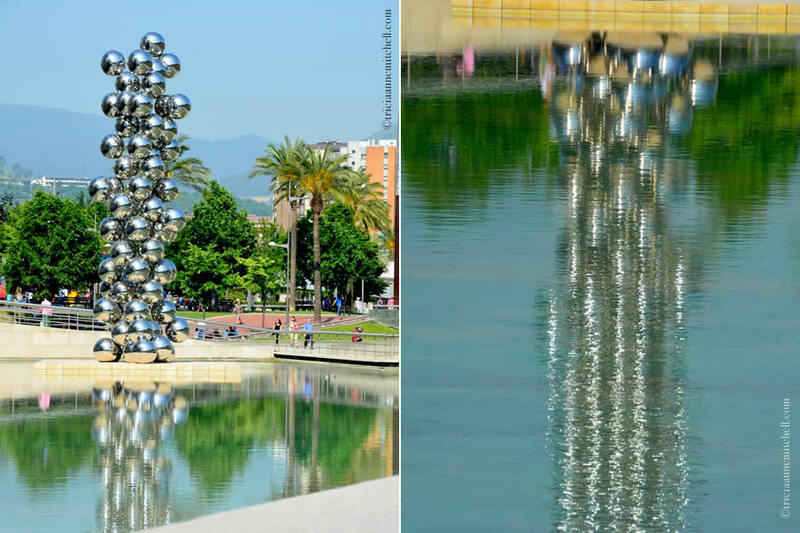 Anish Kapoor’s Tall Tree & the Eye, made of stainless steel and carbon steel. Maman, a bronze, marble, and stainless steel spider, by Louise Bourgeois, is about 27 feet (9 meters) tall. Tulips, another permanent exhibit created by ‘Puppy artist,’ Jeff Koons. See the Guggenheim Museum website for opening hours and details about current exhibits. 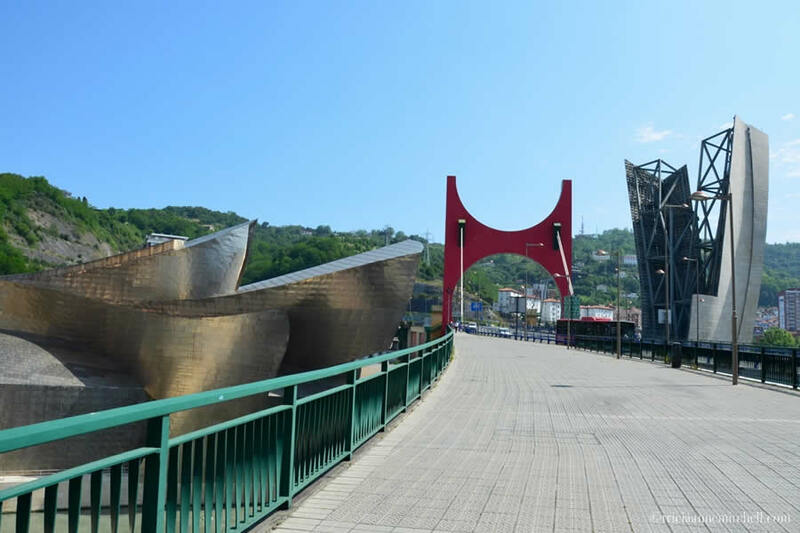 Also, peruse the Bilbao Tourism Board and Basque Country Tourism websites for noteworthy spots to visit throughout Bilbao and the Basque Country. 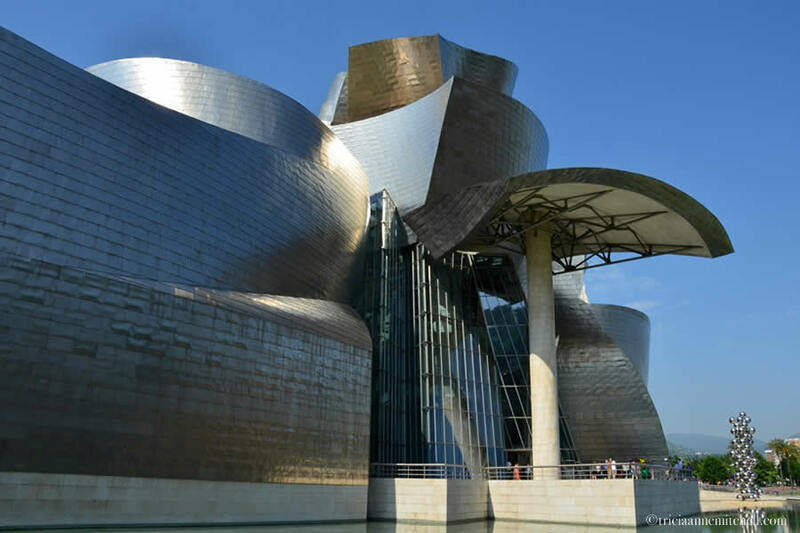 The Bilbao Tourism Board hosted us on a walking tour of the city, and the Guggenheim Museum offered us complimentary tickets to enjoy the museum. To them we say Eskerrik asko – or simply, thank you. 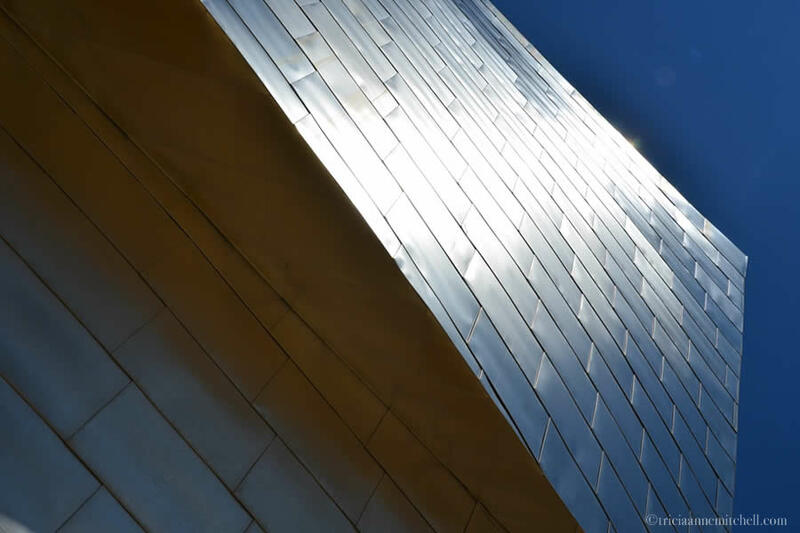 I enjoyed this new post on “Puppy” and the Guggenheim as much as the ‘first time around”. It was a great day! Mary Ann, it sure was! I wonder if Shawn and I might show up in the collage of images from Yoko Ono’s exhibition with the pillow cases? :) We were lucky to have seen The Visitors before it leaves the Guggenheim too, as it’s only there for a few more weeks. Amazing! Thanks for the great pictures. Cornelia, I’d never seen any of Koon’s art before, but enjoyed Puppy and the Tulips. Is some of his work on display in your area too? Thanks also for sharing the link to Gehry’s Disney Hall. His style is indeed apparent in both structures. 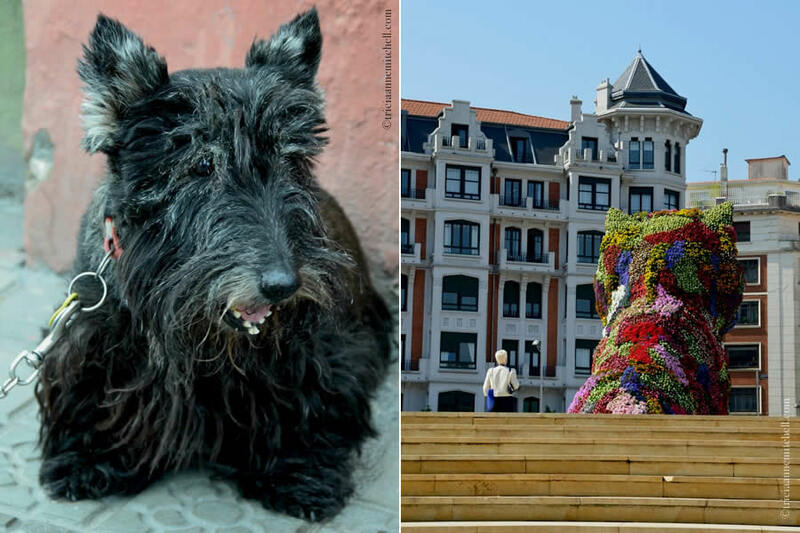 Loved the dog when we saw it earlier this year, trouble was that it was January and Bilbao can be pretty wet! Hi Dale! Puppy is a crowd pleaser. :) Ever since our visit I’ve been curious what Puppy looks like during the winter months – were there colorful blooms like this, or perhaps an evergreen look? The Bilbao locals told us that it can get pretty grey and wet there during the winter months, hence those lovely glassed-in balconies which they told us were popular for harnessing what light there is. Fabulous building, would love to see it. The shape and textures changing in the light must renew the image of the building on a regular basis so that it never has exactly the same appearance. Fascinated by the puppy. I wonder what provided the inspiration for that? Westies look cute, but can be snappy, yelpy wee dogs with uncertain temperaments. Though I have to admit to being biased as many years ago my aunt had one which, for absolutely no reason and with no provocation whatsoever, bit me on the foot. Our new neighbours have one which introduced itself to me by standing in front of me and growling menacingly. The Koons version is much more to my liking. 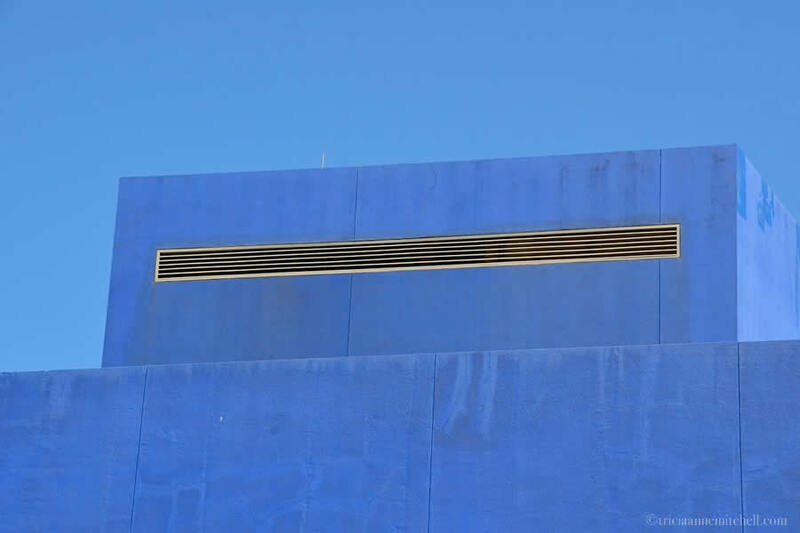 I have always wondered how that incredible outside architecture enhanced the artwork inside. Does it allow for unusual exhibition spaces, more light on the artwork, or a different layout for visitors? Bespoke Traveler, I do remember reading that the design does allow for more light, but it seems that the windows must have UV protection of some sort too to protect the artwork. Inside, there were many vast spaces, as you would expect, but intimate ones too. The latter spaces were especially nice for the more participatory exhibitions. 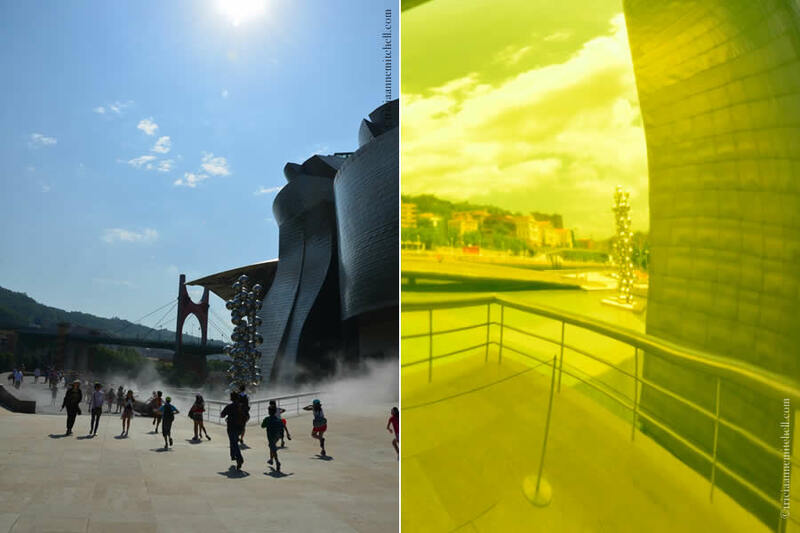 We visited on a gloriously-sunny day, but I’m wondering how the lighting would feel inside on one of Bilbao’s gloomier days, which the locals said are quite common during the winter months. Have you seen any of Frank Gehry’s other structures? A few readers have mentioned that the Walt Disney Concert Hall in LA is quite spectacular. I have not been to the Walt Disney Concert Hall. 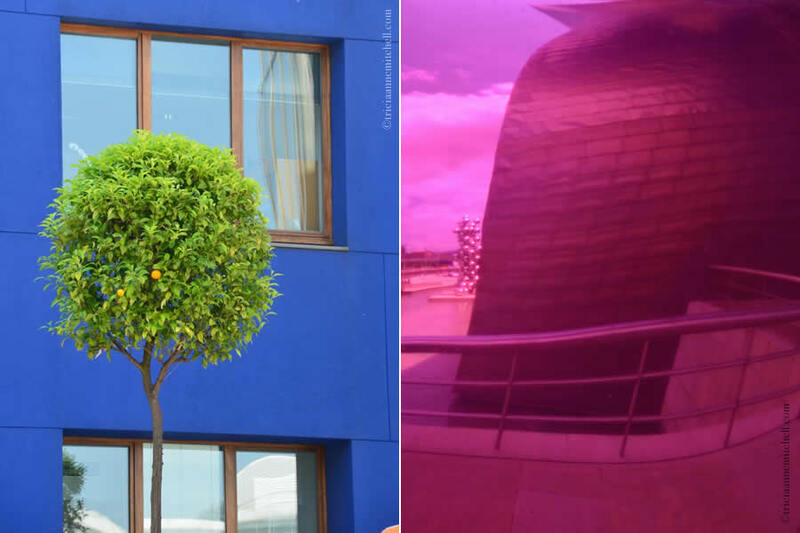 However, there are two Gehry designs I have seen: the Ray and Maria Stata Center in Cambridge, Massachusetts and the Jay Pritzker Pavilion in Millennium Park, Chicago. Though very different features, he has a unique style which unmistakably mark his architectural pieces. The Stata Center is a smaller piece, which while not awe-inspiring, felt fun and whimsical to me. 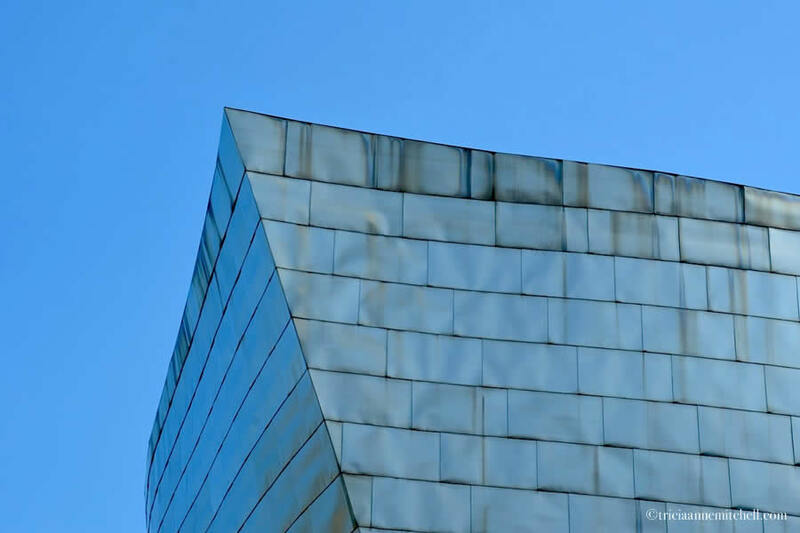 It’s fun to hear of others’ Gehry structure-sightings and favorites. :) While I’ve not seen it in person, the Stata Center reminds me of Prague’s Dancing House, one Gehry design that Terri of Gallivance pointed out. Did you see the Pritzker Pavilion by night? It certainly looks dramatic bathed in colorful lighting! No, I have only seen it by day. Terri, Puppy is indeed a fantastic anti-depressant, and I think his natural composition makes him the perfect complement to his metallic museum neighbor. 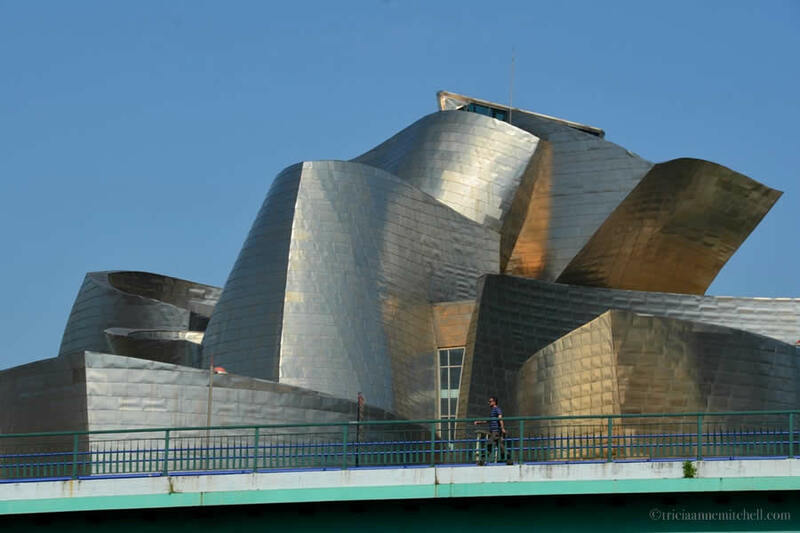 As a Guggenheim-groupie :) have you and James seen any of Frank Gehry’s other structures? Terri, ah, now I remember seeing Prague’s Dancing House years ago. I hadn’t made the connection that it was also Gehry’s design until recently though. What a fitting nickname! It’s funny, we went in June in Seou, South Korea, in Leeum, Samsung Museum of Art and we were excited to see “Maman” spider, but she was no longer there. 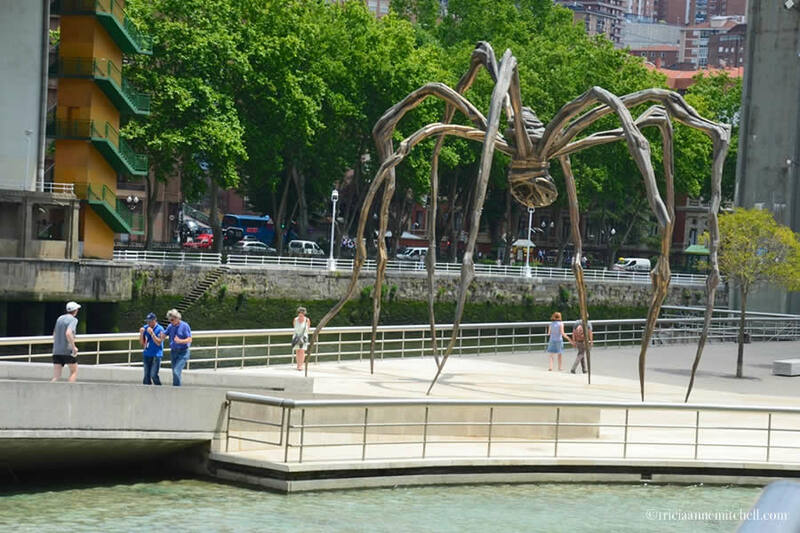 Glad to know that we can go to Bilbao to see a “Maman” spider. Hi Narita, a pleasure to connect. :) It’s interesting to hear that there are ‘Maman’ cousins in other corners of the world. When you saw Puppy back in 1997, was she sporting a similar hairdo to what she has now? I’m curious how the flowery styles evolve from season to season, and year to year. Hope you’re well and enjoying the last days of summer! Superb photos, Tricia. Puppy is so amazing. 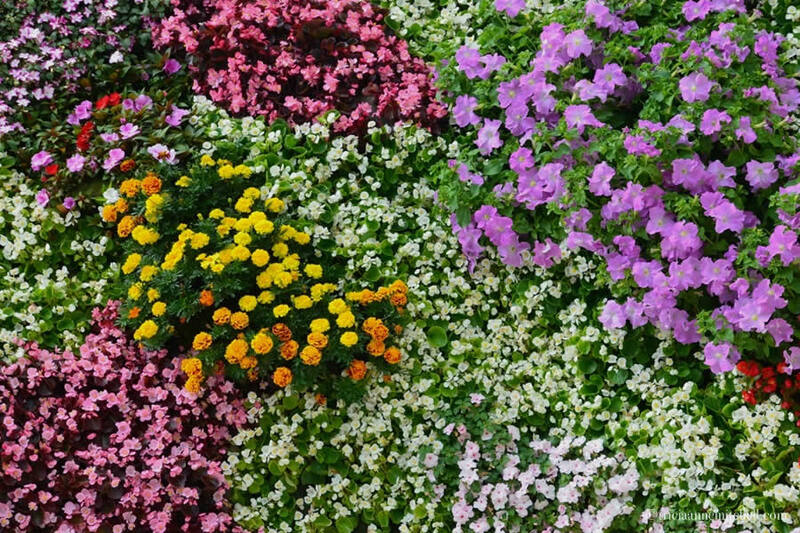 The thought of the many thousands of live flowers needed to create it, is truly mind-boggling. Anotherday2paradise, thanks so much, though I must defer credit to the masterful subject matter. :) Speaking of all those flowers, I’d be curious to see how Puppy’s grooming sessions work. Impressive how the flowery contours are just perfect so as to achieve the Westie look. I am always full of admiration for the creativity of sculptures and these are wonderful. Puppy is amazing and I love the tulips. Carol, topiaries are a wonderful collaboration between man and nature, aren’t they? Are you able to grow tulips where you live? It doesn’t get cold enough for long enough to grow tulips naturally. The bulbs have to be refrigerated at very low temperatures and even then the flowers don’t last very long. It’s not worth the effort. Other bulbs like daffodils grow quite well though. 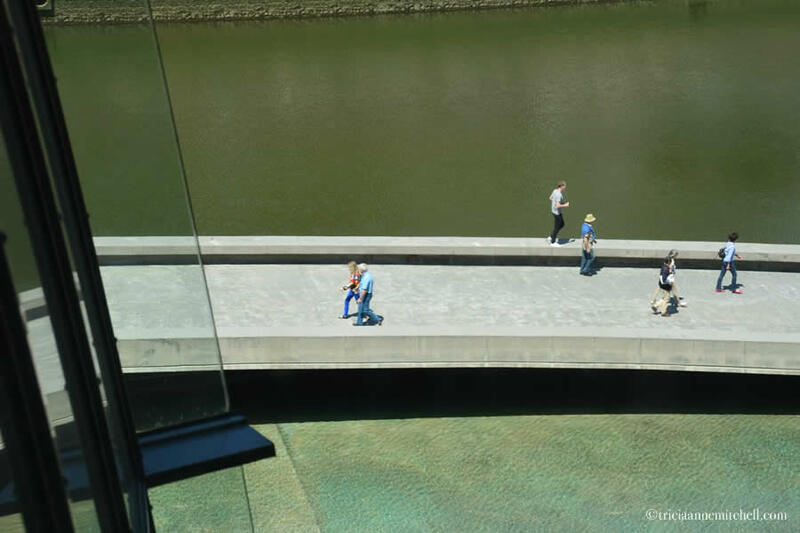 I have drooled over Bilbao ever since I watched two programs: “Spain on the Road Again” and “The Art of Spain”. I would like to do an extended road-trip throughout the country to soak in the history, art & architecture, food & drink, and of course, get to know some of her people. Hi there, Henry! Ah, a road trip through the country does sound like a dream, because up until now, our visits to Spain have been mostly long-weekend jaunts. I certainly feel fortunate to have done those, but I’d love to engage in some slower travel. I was initially most curious about digging deeper into Andalusia, but now that I’ve seen a bit of Basque Country and Galicia, my curiosity has been piqued elsewhere. Great post, it’s on my list. Thank you, Virginia. With such a mix of manmade and natural beauty (particular the blend of flowers) it’s a fun place to photograph. Oh Tricia. I so enjoyed your narrative and photos of this incredible museum. I am sure there is something there for everyone, and of course, puppy is the charmer. Lynne, glad you enjoyed the Guggenheim glimpses. As we walked around the city and saw real life Puppy-lookalikes, we had to smile. No wonder the flowery version is the darling of Bilbao! Big Cities Bright Lights, thanks for stopping by and for your compliment. When you walked through The Matter of Time did you find yourself wanting to test out the acoustics too? :) It’s a work that’s also a delight to enjoy with a bird’s eye perspective.